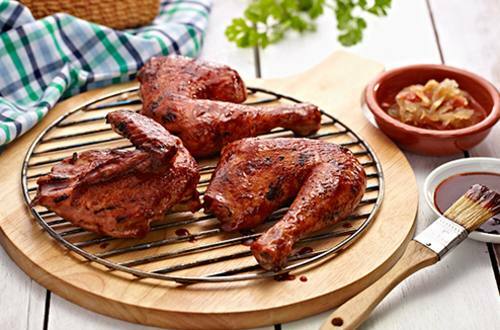 1 To bring out the best flavour in this chicken bbq recipe, place the meat in a heavy duty food-grade plastic bag. Pour in the Knorr Liquid Seasoning, soy sauce, tomato sauce, brown sugar, calamansi juice and canola oil. Make sure the plastic bag where you put the meat in is compressed and sealed like a vacuum to remove the air bubbles. Massage the meat in the plastic bag and watch as it begins to become fully coated with the ingredients. This technique allows you to save on the amount of marinade and also saves storage space. To maximize the flavour of the marinade, leave the chicken in the chiller to marinate overnight. 2 Transfer chicken and marinade in a pot. Let simmer for 10 minutes over medium heat. Remove chicken from sauce/marinade. Continue to cook sauce/marinade until it has thickened. Set this aside. 3 Sprinkle ground black pepper onto the chicken just before grilling over hot coals. Occasionally brush the chicken with the sauce to fully flavor the meat. 4 All you need now is hot rice and this Chicken BBQ is ready to be shared with the family.